HILO – HDOT is pleased to announce that the Hilo International Airport (ITO) received an award for outstanding and continued safety and compliance performance from the Federal Aviation Administration (FAA) during the Annual Airports Conference Awards on June 13, 2017. Under the direction of Airport District Manager Steven Santiago, the Hilo International Airport flourishes because of its strong leadership and the devotion of its staff to constantly improve the airport’s facilities, aviation safety programs, and community outreach. The Hilo International Airport continues to thrive largely because of the capital improvements and maintenance projects that enhance the airport’s facilities. This year several projects are planned including terminal improvements to the existing airport restrooms; design of the arcade building upgrades which include enclosing and air conditioning the second floor; and the design and reconstruction of the aircraft apron areas. There will also be construction for noise attenuation to benefit the surrounding community of Keaukaha, parking lot repaving at the main terminal, and the addition of vehicle canopies over the parking lot entries and exits. In addition to airport facility projects, a major component that elevates Hilo International Airport is its outstanding aviation safety program. Santiago has shown dedication to the implementation of activities that have improved airport safety. He identified and implemented services for the pilot community including safety briefings and airport operating rules, and he exposed pilots to WINGS, an FAA educational pilot proficiency program. It is the leadership and integrity of Santiago and his team that makes Hilo International Airport worthy of the Outstanding Airport Award. HDOT strives for growth and efficiency at the Hilo International Airport in order to create a safe and comfortable environment that will leave visitors and residents with a positive impression of Hawaii. HDOT is making improvements to our airports statewide through the Hawaii Airports Modernization program. More information can be found by clicking here. 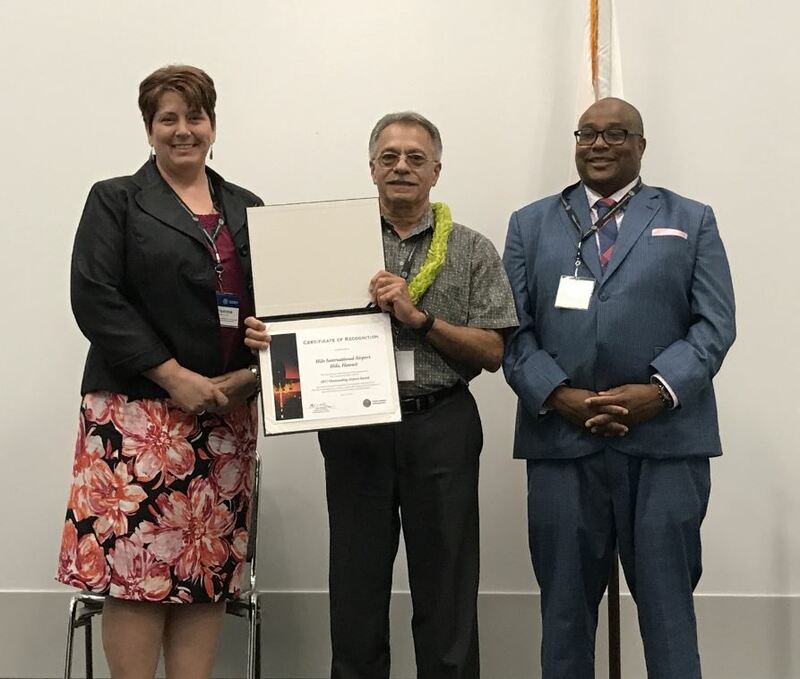 Airport District Manager Steven Santiago proudly accepts the FAA’s Outstanding Airport Award for Hilo International Airport.